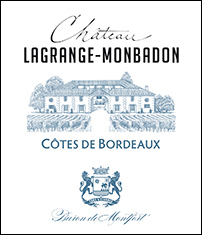 Huddling at the feet of the feudal castle of Monbadon, Château Lagrange Monbadon can be found at Monbadon-Puisseguin, 40 kilometers from Bordeaux. Next to the village church, built in the 11th century , the vineyard of 30 hectares benefits from a clay and limestone soil where a ferruginous subsoil gives colourful wine with softness and flavor. This wine can be enjoyed now, or age in your cellar, and will be perfect with starters and white meats.